In the May 5th broadcasting of YHY’s Sketchbook, hip-hop musicians Tiger JK, Bizzy, and t (Yoonmirae) performed ‘Get It In‘ and ‘Monster‘. 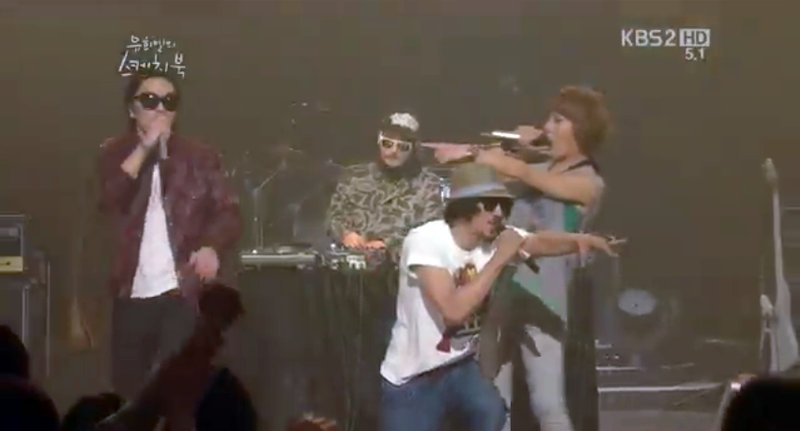 This episode of YHY’s Sketchbook featured hip-hop musicians Tiger JK and Yoonmirae, as well as Bizzy and DJ Juice. This entry was posted in Miscellaneous, News, Videos and tagged bizzy, dj juice, Drunken Tiger, get it in, monster, t, Tasha, Tiger JK, yhy sketchbook, yhy's sketchbook, Yoonmirae. Bookmark the permalink.